Rival presidents led rival mass rallies in Venezuela this weekend as the country’s political stand-off intensified with embattled President Nicolás Maduro backing a plan to move against the last bastion of the opposition after its leader, Juan Guaidó, declared himself interim president on January 23rd. Speaking at a rally to commemorate 20 years in power for his populist Chavismo movement, Maduro once again ruled out stepping aside and holding new presidential elections as demanded by most countries in the Americas and the European Union. But he backed a proposal by his own United Socialist Party of Venezuela to bring forward to this year elections for the national assembly, the country’s only institution controlled by the opposition. “They want to bring forward elections? Let’s have elections!” said a defiant Maduro, whose government has been widely denounced for blatant poll-rigging in recent years. Meanwhile at a rival rally in Caracas, Guaidó renewed his calls for the military to abandon the regime on the same day that an air force general became the most senior serving officer to recognise him as president. In a video posted on Saturday on social media, Francisco Yánez said a democratic transition was imminent. “People of Venezuela, 90 per cent of the armed forces are not with the dictator,” he added. Venezuela’s high command has declared its loyalty to Maduro but there are increasing signs of splits within the military, with the regime believed to be ever more reliant on a spy network run by Cuban intelligence officers to identify and neuter attempted insurrections against the regime by lower-ranking officers. Guaidó called on supporters to keep up the pressure on Maduro to quit what he classified as his “usurpation” of the presidency by holding more rallies this month. He also announced humanitarian aid from the United States would soon be arriving via Colombia, Brazil and an unnamed Caribbean island and called on soldiers manning the frontier to let it enter the country. Maduro denounced the aid operation as a pretext for a military intervention by the US. Obama administration efforts to bolster the sharing of critical intelligence data with Cuba is likely to benefit Iran, which has been quietly bolstering its foothold in the country with the communist government’s approval, according to conversations with members of Congress and other sources familiar with the matter. A little noticed Obama administration directive on Cuba, released Oct. 14, instructed the U.S. director of national intelligence to assist and cooperate with Cuba’s intelligence services. The directive has raised red flags on Capitol Hill, where some lawmakers are concerned that Cuba will pass along critical U.S. intelligence to the Iranians, who have made moves in recent years to extend their influence in the communist country and other Latin American countries hostile to the United States. 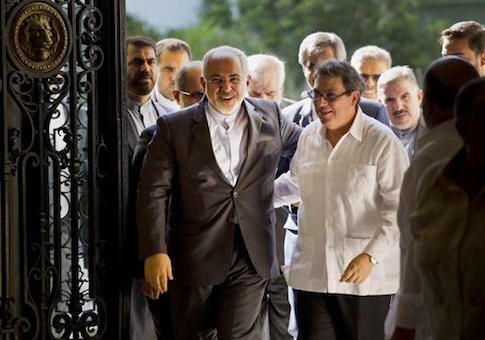 Iran’s interest in Cuba was on fully display earlier this year when Javad Zarif, Iran’s foreign minister, went on a goodwill tour throughout Latin America that included stops in Cuba and Venezuela, among others. The goal of this visit, sources told the Washington Free Beacon, was to solidify Iran’s growing terrorist network in the region and ensure the Islamic Republic maintains its presence along America’s doorstep. Iran has been interested in Latin America for years, but now has the resources to pursue a footprint in the region as a result of the cash windfall provided by last summer’s comprehensive nuclear agreement. Hezbollah, the terror organization funded and directed by Iran, has had assets in the region for some time. Roberto Alvarez Quinones is a Cuban journalist who spent over 25-years in Castro’s state-run Granma newspaper, as an economic commentator. He also served stints at the Cuban Central Bank and the Ministry of Foreign Trade. The Castro brothers have always understood U.S. presidents and the intricacies of political power better than the Americans have comprehended the Cubans. In Washington they still can’t fathom why the two brothers and their military junta don’t want friendly and harmonious relations with the U.S., but rather for the embargo to be lifted, and to receive loans and tourists from the north with bulging wallets. Simple as that. With the Venezuelan crisis deteriorating by the minute, an end to the embargo has become urgent for the Castro regime. But having politically cordial and normal relations with Washington is not in their best interest. Hence, they will do everything possible to prevent them, or to sabotage them, even if the “blockade” (a military term that has nothing to do with a unilateral trade embargo placed by one country on another) is lifted. The dictatorial elite’s view is that “too much” rapprochement with the US would generate great internal and external trouble, as it would mean “betraying” its history as an anti-American leftist leader in Latin America. But, above all, it could undermine the regime’s Orwellian control over all of Cuban society. People on the island feel would be less fearful of demanding more freedoms if the “Empire” were a strong ally. That war did not end with the reopening of embassies in Havana and Washington. And it will not end as long as the island is ruled by Castro and the commanders who joined the anti-U.S. crusade conceived by their leader. 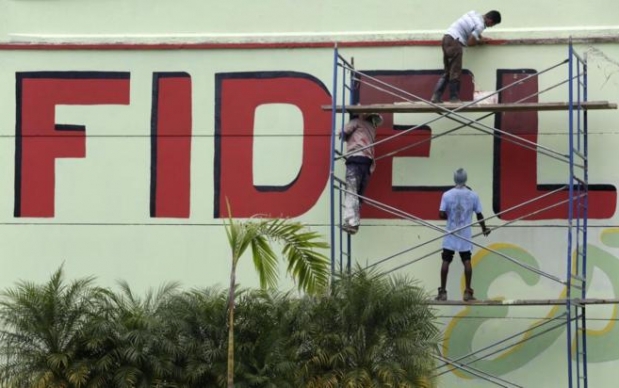 There will be no close relationship between Cuba and the United States until there is a new “de-ideologized” political leadership on the island. U.S. prosecutors are investigating several high-ranking Venezuelan officials, including the president of the country’s congress, on suspicion that they have turned the country into a global hub for cocaine trafficking and money laundering, according to more than a dozen people familiar with the probes. An elite unit of the Drug Enforcement Administration in Washington and federal prosecutors in New York and Miami are building cases using evidence provided by former cocaine traffickers, informants who were once close to top Venezuelan officials and defectors from the Venezuelan military, these people say. 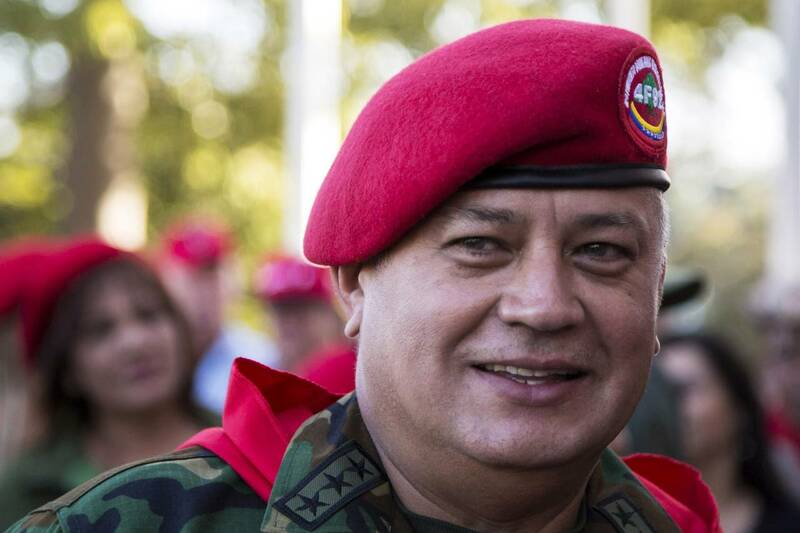 A leading target, according to a Justice Department official and other American authorities, is National Assembly President Diosdado Cabello, considered the country’s second most-powerful man. Representatives of Mr. Cabello and other officials didn’t return phone calls and emails requesting comment. In the past, Venezuelan authorities have rejected allegations of high-ranking involvement in the drug trade as an attempt by the U.S. to destabilize the leftist government in Caracas. The United States and Cuba will hold a new round of talks on re-establishing diplomatic relations and re-opening embassies Monday, the State Department said Friday. Roberta Jacobson, US Assistant Secretary of State for Western Hemisphere, will travel to the Cuban capital of Havana Sunday for talks with Josefina Vidal, Director General of the US Division of Cuba’s Ministry of Foreign Affairs. “A US Embassy in Havana will allow the United States to more effectively promote our interests and values, and increase engagement with the Cuban people,” it said. President Barack Obama and Cuban President Raul Castro announced in December that they have agreed to restore diplomatic relations, in a move to end more than half a century of estrangement between the two countries. The two sides have held two rounds of talks in hopes of reopening embassies before a regional summit in April. On Friday, a senior State Department official told reporters on a conference call that the US still hopes that the embassies could be reopened before the Summit of the Americas slated for April 10-11. One sticking point of the talks is Cuba’s inclusion in the US blacklist of state sponsors of terrorism since 1982. In announcing the policy shift toward Cuba in December, President Obama instructed Secretary of State John Kerry to review Cuba’s designation in the blacklist. 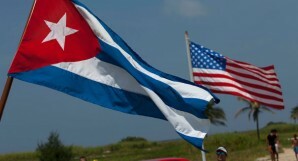 The official, who spoke on condition of anonymity, told reporters that the US is still reviewing whether Cuba can be removed from the blacklist and will “complete that as quickly as we can.” “We have always said that that should not be linked to the reestablishment of diplomatic relations or opening of embassies,” said the official, who dismissed that Cuba’s support for Venezuela following US sanctions would affect talks between Washington and Havana. 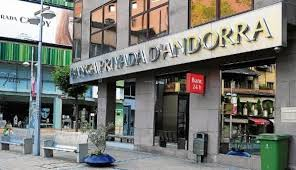 The U.S. Treasury’s Financial Crimes Enforcement Network (FinCEN) yesterday named Banca Privada d’Andorra (BPA) as a foreign “money laundering concern.” FinCEN’s notice also said a senior BPA manager accepted exorbitant commissions to process transactions related to Venezuelan third–party money launderers. “This activity involved the development of shell companies and complex financial products to siphon off funds from Venezuela’s public oil company Petroleos de Venezuela (PDVSA). BPA processed approximately $2 billion in transactions related to this money laundering scheme,” reported FinCEN. Reuters subsequently reported that the government of Andorra has taken control of BPA. On Tuesday, Venezuelan activist María Laura Liscano denounced Cuban espionage against opponents of the Nicolás Maduro regime who reside in Chile, following Monday’s report by Chilean television station Mega. Liscano calls herself a spokesperson for Venezuelans in Chile, where she has lived the past four years since leaving her job as an intelligence analyst for the Venezuelan government. The Mega report focuses on a Cuban national who claims to be an agent for a Cuban diplomat in Santiago, Chile. The individual claims the diplomat ordered him to infiltrate the leadership of Venezuelan opposition groups operating in Chile, and report on their activity. “The espionage is coordinated by the Cuban embassy, and is directed at certain sectors in Chile that oppose Maduro. This is not the first time this has happened. In 2010, a Cuban leader in Chile denounced a similar practice being carried out against the Cuban community,” Liscano said. “We always knew that we were vulnerable to espionage; there have been many times when we were protesting, and people who are opposed to us would come and take pictures,” she said. Liscano said she represents a nonpartisan Venezuelan community that share the same concerns expressed by student protesters who took to the streets in Venezuela in February. Former Dirección General De Inteligencia (DGI) officer Enrique García Diaz reports Alexis Frutos was selected for the DGI during his final year of high school. He then moved to Havana in 1976 to start his spy career. He married an Afro-Cuban woman who gave birth to two daughters during the 1980s. She was not a DGI official at that time. 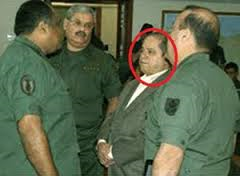 According to the CIA Directory of Cuban officials, Sarraf served as a Prensa Latina (PRELA) representative at the Cuban Embassy in the late 1970s. García Diaz and the CIA both noted Frutos Weeden’s assignment to Mexico City as the Commercial Attaché in the early-mid 1980s. García Diaz said as of his 1989 defection, the DGI Centro in Mexico had 15 officers and had deeply penetrated the Mexican government, every major political party and all key societal sectors. He believes the (now) Directorate of Intelligence (DI) remains deeply rooted throughout the nation to this day. Alexis Frutos is currently the Political Counselor at the Cuba Embassy in Venezuela, where García Diaz suspects he serves as the DI Centro Chief. Visite http://www.canalntn24.com/ Rafael Alejandro Hernández, abogado y exagente de seguridad del estado de Cuba, habló en el programa La Tarde de NTN24 y aseguró que no está huyendo de un lugar sino “de alguien”. Hernández también hablo sobre su situación en Colombia y afirmó que no es un migrante económico, sino un “perseguido por cuestiones políticas”. Venezuela has had a rough year. With inflation topping 60% in May, new talk of raising the country’s incredibly low gas prices and shortages of goods ranging from coffee to toilet paper, the socialist government is reaching out to allies in an effort to alleviate the country’s pervasive economic problems. Meanwhile, the Venezuelan public has very different views about two of the nation’s most important trade partners: the United States and Cuba. Venezuela’s socialist leader Nicolás Maduro is no fan of the U.S., but that doesn’t mean Venezuelans take the same view. According to Pew Research Center’s Spring 2014 global survey, Venezuelans have generally positive attitudes concerning the U.S. At a rate of two-to-one, the Venezuelan public holds a more favorable (62%) than unfavorable (31%) view of their biggest trade partner. This represents a nine point uptick in support since 2013, when 53% shared positive feelings toward the U.S. Younger Venezuelans are especially likely to view the U.S. favorably – 66% of those ages 18-29 express a positive opinion. Still, a majority of those ages 50 and older (56%) also perceive the U.S. favorably. The biggest disagreements about the U.S. break along ideological lines. Venezuelans who lean to the right of the political spectrum see the U.S. in an overwhelmingly positive light (84%), while only 12% have a negative opinion. Venezuela’s political left, which aligns with President Maduro’s United Socialist Party of Venezuela, tends to be more critical of the U.S. (62% unfavorable v. 34% favorable). This is none too surprising given the tumultuous relationship between Maduro and the U.S. in recent months and the many years of tension between Washington and Maduro’s predecessor, Hugo Chávez. Chávez, who blamed the U.S. for organizing a coup against him in 2002, often stoked anti-American sentiment with colorful quips, including claims that the U.S. “invented technology to spread cancer” to South American leaders and referring to then-President George W. Bush as “the devil,” “a donkey” and “a drunkard.” Despite this, a majority of moderates (63%) see America favorably. Findings continue here: Venezuelans prefers U.S.